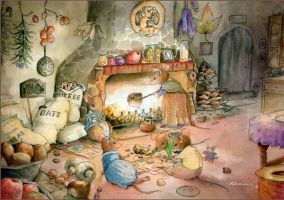 Illustration to another children poem by the same author, Jadwiga Nazimek. This one is for elder children and it's a bit more complicated. It's about going away on train one winter, through the snowy forest, and when you look closely you will see the forest is full of magical creatures, shining eyes and talking mushrooms. In short, a jungle under snow. A few inks on gray paper (black, blue, white) and crayons. Wszystkie rysunki są bardzo piękne!!! This illustration is so good. It's amazing! You did this with crayon???? gosh, I am not very good at coloring in general. I really like how everything is hidden-ish. Crayons are on top, below there's ink; it makes colors much deeper. Try one day! Works best in shadow areas. Are they just crayola crayons? just crayons, only that I try to use better quality ones then made-in-china-school-crayons, because they don't really draw and this is frustrating. For me Derwent pencils work fine. If you don't want to pay for crayons advertised "for professional artists", try something from "for art students" class. It makes a big difference. This is absolutely magical! It makes me wish for winter! Winter is a great, yes. Today we have awfully hot day here. Me too, at the momenT. It's +32C. Heh. Przyjedz do Ameryki Asiu. Ja ci pokaze co to jest wysoka temperatura. Tutaj jest tak samo z deszczoblotosniegu, ale gorzej. Niemożliwe. to gdzie są te skaliste pustynie z westernów? I love this piece. It has a nice classical feel to it!